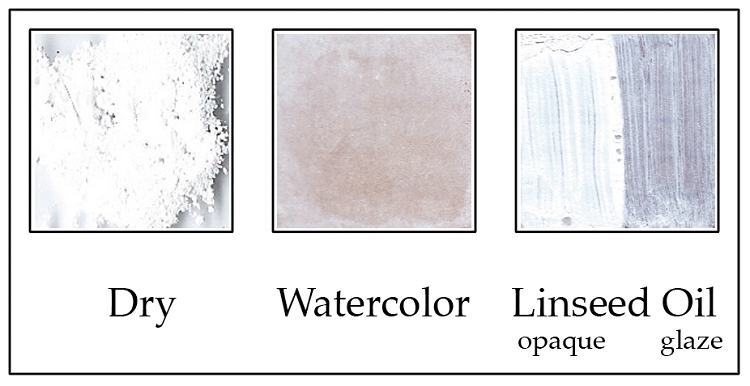 Q: Does this white pigment have any warnings against skin contact like titanium white does? A: The Titanium White actually does not have a specific skin contact warning. The caution is against inhalation. We always advocate avoiding skin contact with any of our pigments. Q: For health reasons, would you advise against using earth pigments on silk? It would be used for carves and clothing (and therefore have skin contact). A: The earth pigments should be fine. They are a risk when they are in dry powder form, but not bound in a binder.